Some minor tweaking and testing. Now the 900Mhz radios will not connect. Argh. Installed battery wiring and 900Mhz radio wiring. Clip leads running Ultimeter fell off killing the internal 9V backup battery (oops). Reminder to document initialization procedure for Ultimeter in case it happens again. Built case for other 900MHz radio. Programming of OpenTracker+ and Maxstream. Discovered wiring errors in adapter cable for OT+ (oops). Setup for 2400 baud. Ultimeter now sending data and keying radio (after some more wiring errors were found). Adjusted deviation and levels on OT+ and Icom radio to 3 KHz. Printed all documentation and inserted in a ring binder. I should have made two as there should be one left at the site. Build up basic weather station on a bookshelf board. Ultimeter 2100, OpenTracker+, power distribution bus, junction box, Icom IC-? ?a transceiver, MaxStream 900Mhz link radio, Solar Guard charge controller. Missing from the photo are the battery charger and battery. The Ultimeter has 2 serial ports. 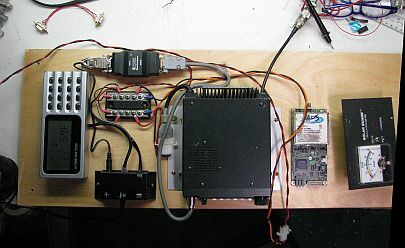 One goes to the OpenTracker+ and the transceiver which will be using APRS on 144.39Mhz to distribute the weather data. The 2nd serial port will go to the MaxStream 900Mhz link radio. The above weather station will be located at the WR6AOK repeater site in Ben Lomond. The other end will be at some location with internet access (probably my house) to another MaxStream radio. The computer will probably be a Seagate Miro NAS (network attached storage) box, hacked to run Windoze 2000 and Weather-Display software. From there, the data will be mirrored to a public web site for viewing. Jeff AE6KS Icom IC-? ?a, MaxStream Radios, Seagate NAS box, hardware, construction, etc.